Christmas in July Challenge Winner! Tis the Season Challenge Winner! Design Team Feature Thursday - Karen Amidon! These hops are always so much fun! We are very excited to once again be a Super Sponsor. Jeanne Streiff is here today sharing a couple cards for the hop. I stamped the background with Cover-a-Card Flourishes. Comfort Cocoa was stamped onto white cardstock, colored with markers and then cut out. and added to the scallop mat. I made a little flag with the sentiment and attached it to the card. I made a washy background with ink and then stamped the cup from Coffee to Go in matching inks. I then die cut the cup with the matching dies. I added a stamped and die cut a succulent from Cup of Sweet Succulents and added it to the cup. The sentiment is also from the Cup of Sweet Succulents set. Thank you to everyone who entered our Christmas in July Challenge! Thank you to everyone who entered our "Tis the Season Challenge! Check out Jenny's pretty tag! Today's featured Designer is Karen Amidon! Wow! Check out Linda's beautiful Christmas card! 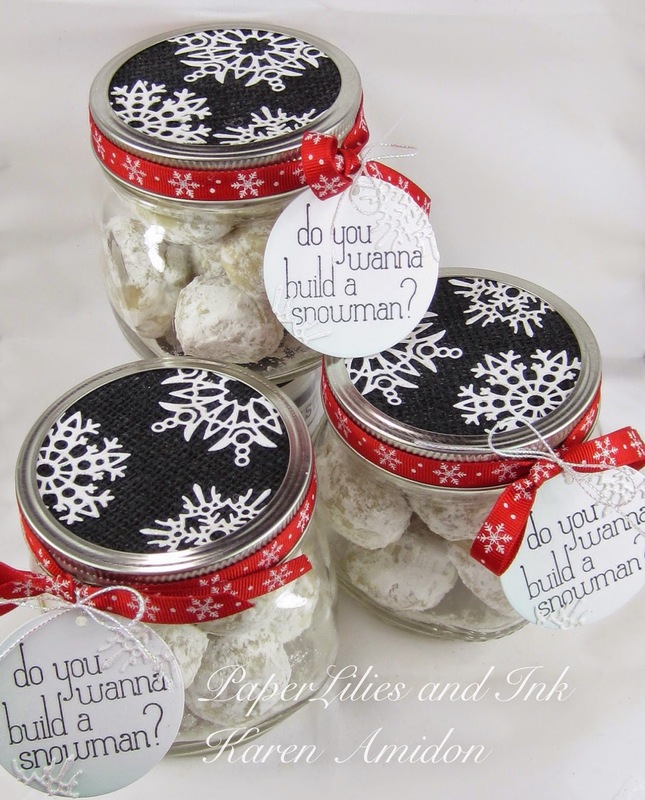 Thank you to everyone who entered our Winter Chill Challenge, all of the projects spectacular! The winner is...Anne Ryan ! 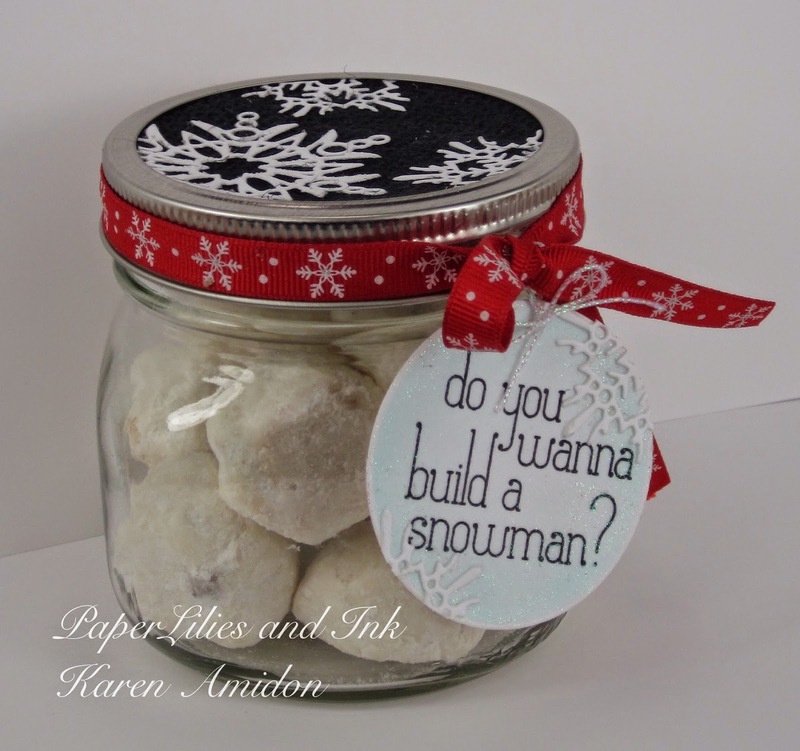 Adorable snowman cookie jars from Karen Amidon! Anna Wight shares 3 different beautiful cards using F7765 Snowy Branch Cardinal stamp. 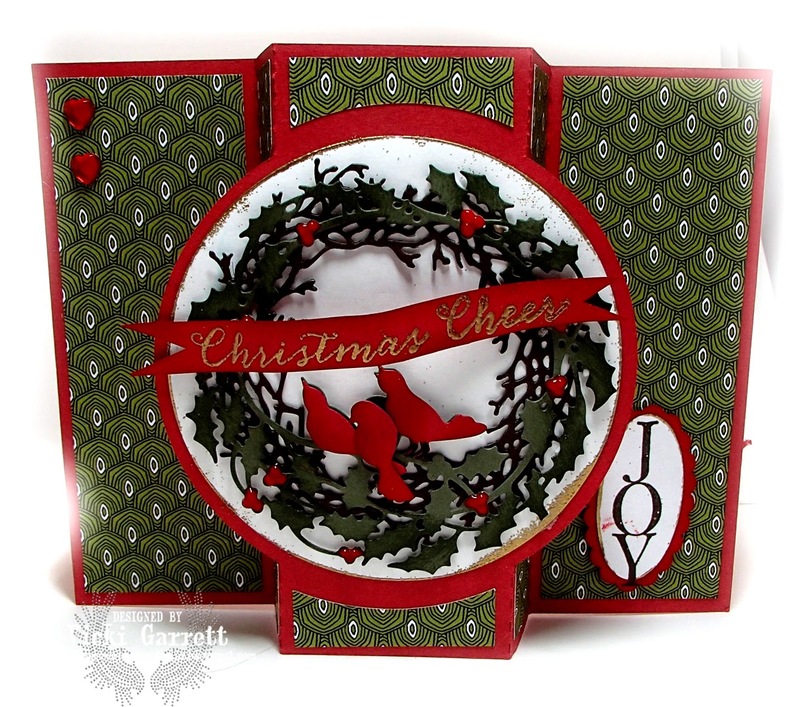 Today's card is from Dina Kowal using Ornament Trio. 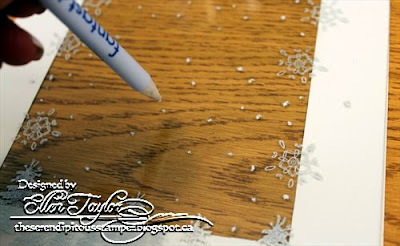 We have a gorgeous snow flake frame tutorial to share today from Ellen Taylor. 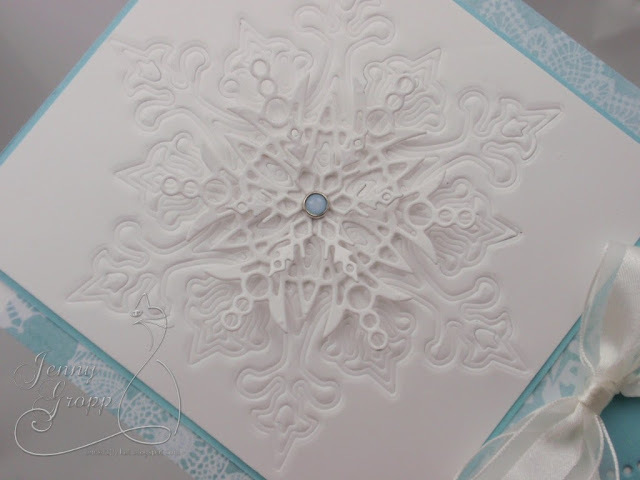 Ellen uses Delicate Snowflakes F6602,Brush Tree Line E7 & DIE - DIE108-F. Ink Impression Obsession's Brush Tree Line E7724 and Delicate Snowflakes F6602 with StazOn Opaque Cotton White and stamp the Delicate Snowflakes randomly on the glass from the picture frame. 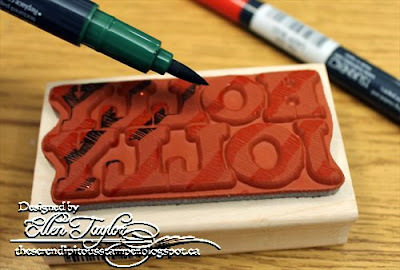 Using the same Ink stamp the Brush Tree Line on the bottom of the glass. You can see I laid the matting under the glass to get a feel for how much to stamp. 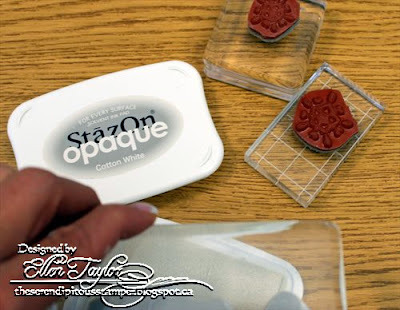 Dab a Fantastix into the StazOn Opaque Cotton White Pad and dot over glass. to give the appearance of snowy weather randomly over the glass. 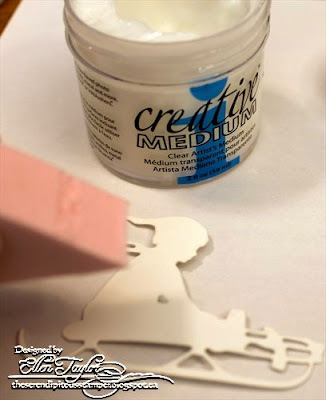 Die cut Impression Obsession's Sled Die DIE108F and using an Ink Blusher dab Clear Creative Medium over it. 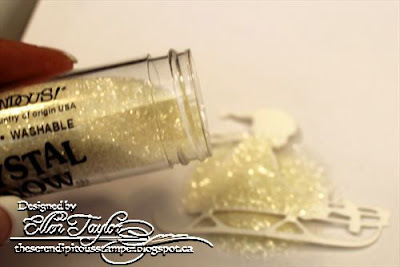 Pour some glitter over top. I have a piece of copy paper under it so I can easily pour the excess glitter back into the bottle. This dries very quickly and is ready to adhere to the front of the glass. Adhere your photo to a piece of patterned paper and assemble your frame back together~EASY PEASY PROJECT!! I had so much fun making this card and it didn’t take me that long at all. 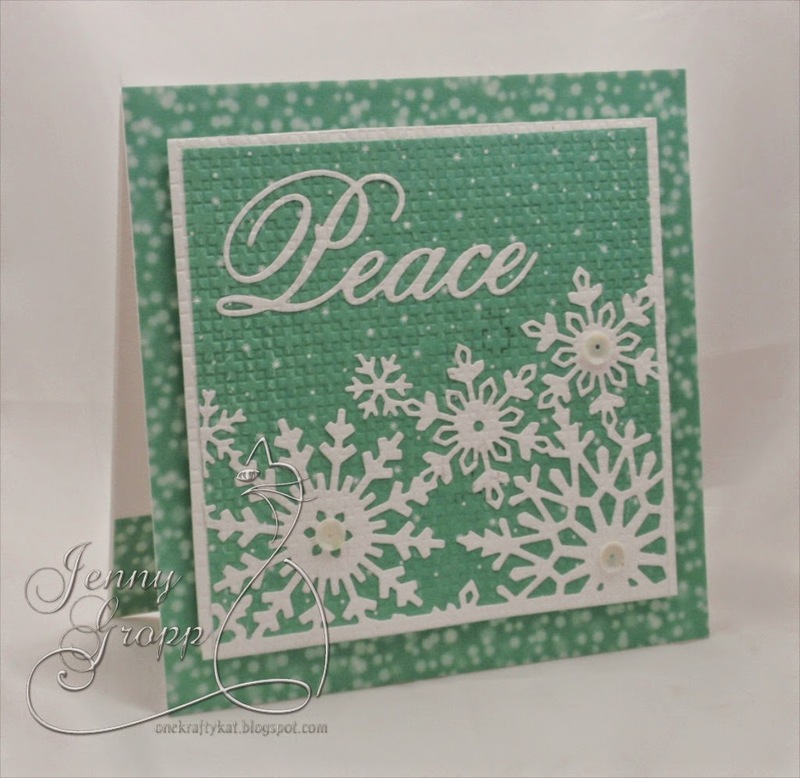 I stamped my background with a Cover-a-card Dotty Circles, my older CAC, and heat embossed with white embossing powder. There is a Cover-a-card Snowflakes stamp and I linked it in my supplies, but I wanted something different. I die cut the Cutout Christmas Tree die four times in different color cardstock. The little ornaments are easy to fill in. For the garland I added some gold glitter. I die cut the Sm. Snowflakes from white cardstock and added a gold pearl to the centers. 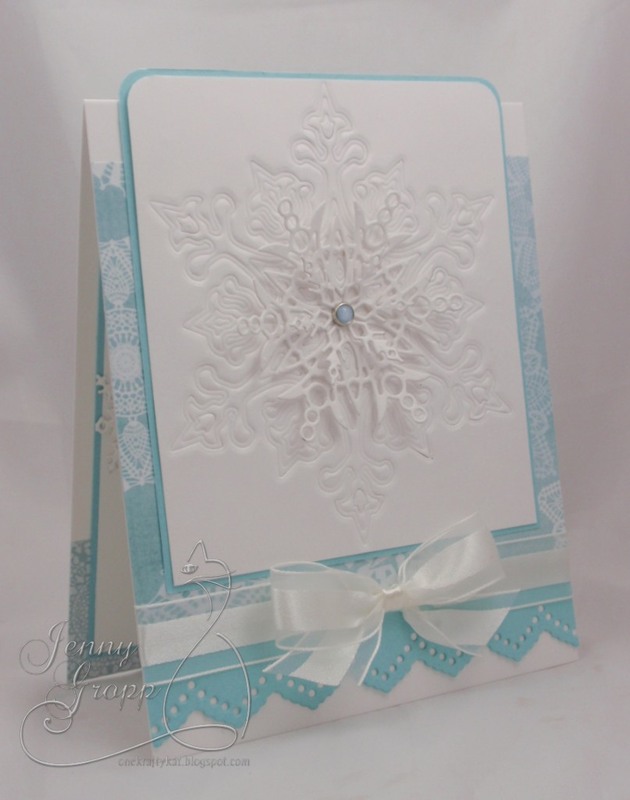 We have a shimmery snowflake card from Jeanne Streiff using H13094 Vintage Scissor Snowflake and D8500 Holiday. I just love the Snowflake Dies from IO! 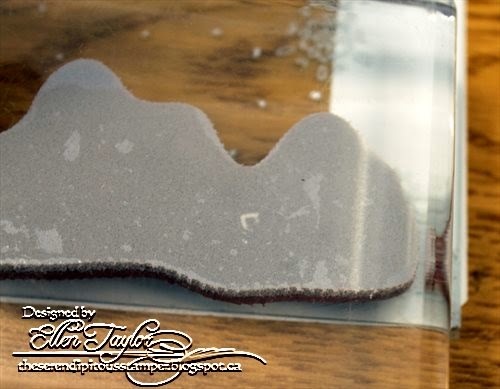 The new largest snowflake IO released cuts all sorts of beautiful and intricate layers. BUT today I just embossed it on the main panel. I used a thicker paper to prevent it from cutting all the way through. 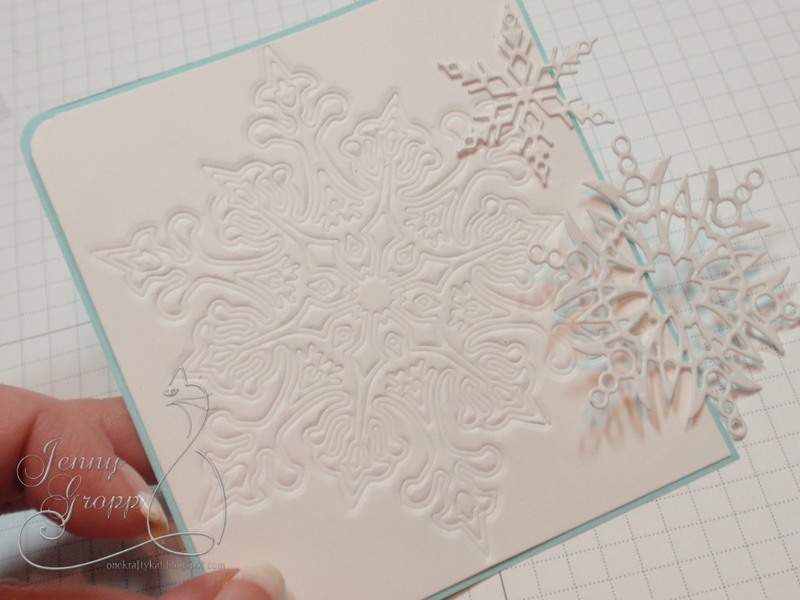 You can see the impression after embossing the large snowflake. The other two die cut snowflakes will get stacked on top and secured with a brad. I added more snow flake pieces on the inside of the card. The sentiment I used is from the NEW Snow Clear Set. 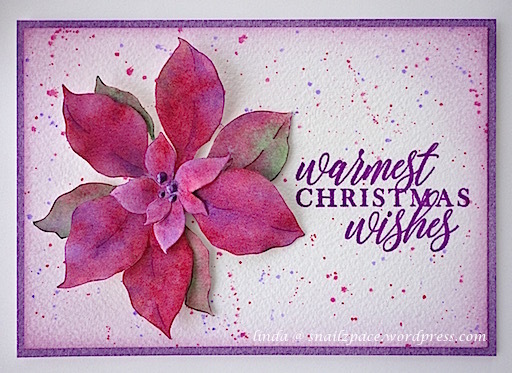 Check out this pretty card from Ellen Taylor! Love the candy striped sentiment! Ellen used Holly Jolly D14121, Holly Wreath DIE109-Y, Twig Wreath Die Set DIE023-X and Sm Snowflake Set DIE100-F for her card. I colored Holly Jolly D14121 directly with Memento Cottage Ivy and Lady Bug Red Markers, leaving uninked strips. 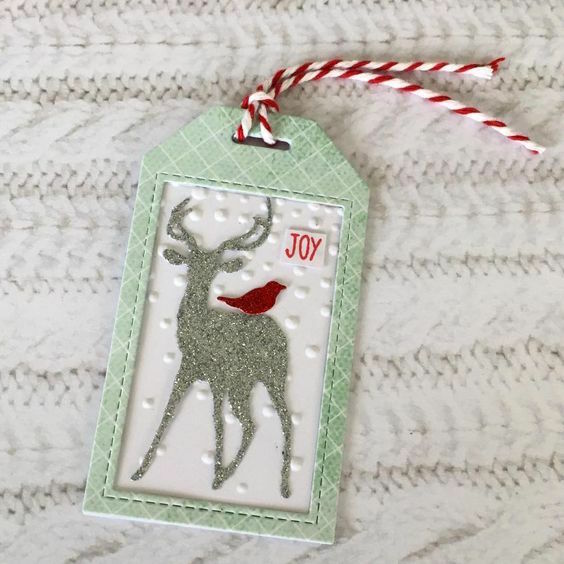 Once stamped on my card stock, the blank strips were glittered up using a Zig 2 way glue pen and some glitter, giving it a sweet candy cane look. The frame for Holly Jolly D14121 was created by die cutting the Holly Wreath DIE109-Y twice, cutting it and adhering it in an oval around the sentiment. I used the berries from the Twig Wreath Die Set DIE023-X and sponged the birds with Memento Rich Cocoa. To finish it off I added a blinged snowflake from the Sm Snowflake Set DIE100-F to top the red bow. I can feel a chill in the air looking at this lovely card from Kittie Caraccioli! 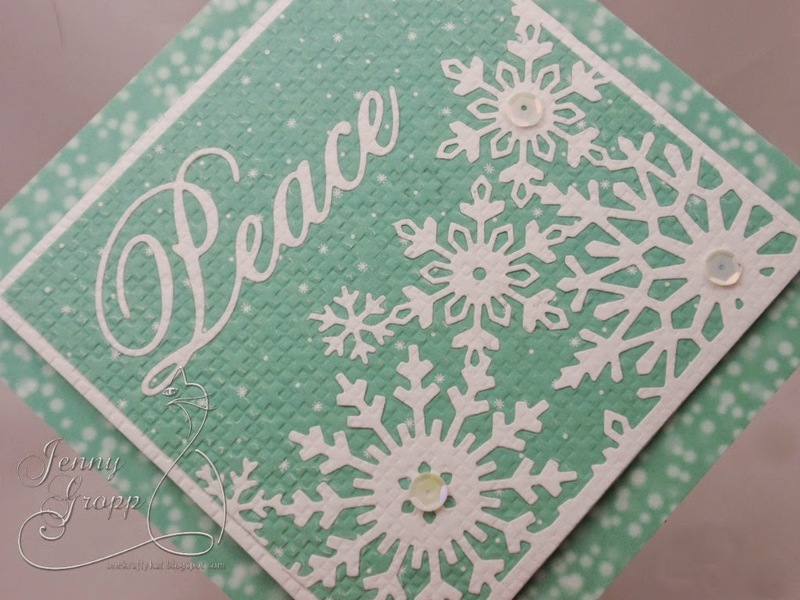 Kittie used the DIE108-F Sled, DIEo84- V Fir Trees and DIE100-F Small Snowflake set dies for her card. I try to stick with the design rule of using odd numbers of images in my design. I usually makes things lots more interesting. Note three snowflakes, five fir trees and one sled. small snowflake set. The crimped ground snow was the first thing attached to the base. Next I arranged the trees, attaching with mounting tape and leaving a nice blue space between for the head of the sledder to show up well.